The committee investigating the blacklist of cultural figures during past administrations on Tuesday announced that 8,931 individuals and 342 groups were unlawfully penalized during the time, and recommended the government establish an independent committee on subsidizing cultural figures. 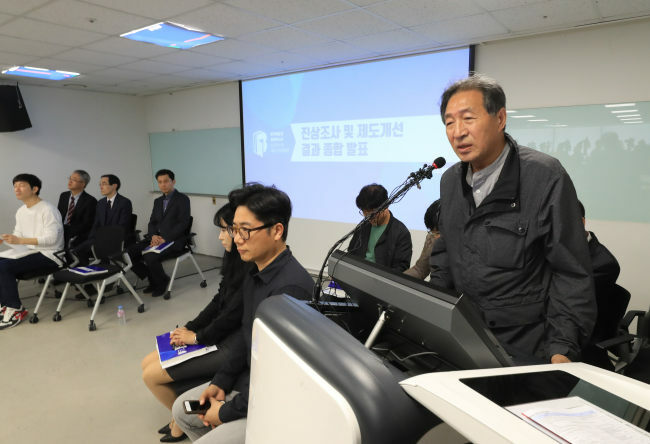 The joint government-civilian committee -- co-headed by Culture Minister Do Jong-hwan and artist Shin Hak-chul -- released its findings during a press conference in Seoul. The committee, launched last July to investigate the blacklist of cultural figures under ex-leader Park Geun-hye, extended its review to include the Lee Myung-bak administration after discovering documents indicating similar irregularities had occurred during Lee’s term in office. The committee said nine different types of lists were created from 2008 to 2016. The film industry was the most heavily affected, with 2,468 parties being illegally monitored or penalized for what the authorities at the time deemed to be leftist or anti-government. Literature, performance, visual arts, traditional art, music and TV followed with 1,707, 1,593, 824, 762, 574 and 313 parties affected in each sector, respectively. Blockbuster movies like “The Host” in 2006 and “Joint Security Area” in 2000 were also deemed unfit, and were ordered to be excluded from overseas Korean film festivals during the Lee administration. In its report, the committee pointed out that Lee’s office focused mostly on penalizing popular artists, among them directors Bong Joon-ho and Park Chang-wook. Park was also on the list of artists and entertainers blacklisted for condemning the government for the 2014 sinking of Sewol ferry. In the Park administration’s case, the committee pointed out that the blacklist was drawn up by a complex chain of command, stretching from the presidential office to the working-level officials. The National Intelligence Service collaborated with the Ministry of Culture, Sports and Tourism to expand upon what the Lee administration had started. In addition to seeking punishment for those involved in the drawing up of the blacklists, the committee recommended that the Culture Ministry take the task of subsidizing the artist off its hands. It called for the creation of an independent committee consisting of the ministry-affiliated Arts Council Korea and major artist supporting organizations. The committee also called for steps to ensure that the Arts Council Korea is run independent from outside influence. A committee on artists‘ freedom of expression should also be established, to report directly to the president, the committee added. “The freedom of expression is something that should have no limits. If a certain art work is deemed not befitting our times (by the public), it will be rejected on its own. But there should be no limit on artists’ rights to express themselves,” said the joint committee head Shin. The committee will publish a white paper on the blacklists before wrapping up its activities by the end of June.